Came across this video of crazy Russians fighting at a wedding. Quite funny. Then there’s another one when a man does something silly during a dance. Funniest part is he acts like nothing happened. Haha! Here’s how to fail a DUI test in style, altho d last one looks like a fake. And stupid cop pulling over a lawn mower. And my fave of all time, which i featured here before. Enjoy. Alcochef Keith Floyd is dead. Heart attack. Since he jalan aged 65, i cant really say he subscribed to the Bohemian motto “Live Fast, Die Young.” He tried hard tho. Good attempt. He was a committed drinker. Wine sales will be affected. His final drink was a glass of red – Fils Cotes de Rhone. It was a 2007 – good year. I was bumming. 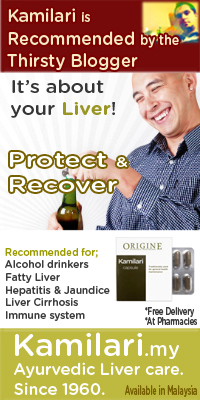 Surprisingly, he did not die of liver failure, which means its ok to drink as much as u want! Must have been food and cigarettes that nailed him. I think they mean two different things. An alco is sumtin else – an affectionate term to describe a guy/girl who likes drinks, ‘appreciates’ them. An aficionado perhaps. Alco dont mean alcoholic. I’ve been called an alco many times, out of pure love. Sallgood. However, the online self-tests for alcoholism have some questions that i answered “Yes” to. Like: “Can you handle more liquor now than when you first started drinking?” I mean, come on. Stupid question. Also: “On the “morning after,” have you been unable to remember part of the evening before – even though friends say you didn’t pass out?” Haha! This one have to admit happened just last week. In fact it’s been happening often. It’s called a Brown-out. At least i got “No”s for these: “Do you sometimes stay drunk for several days at a time?”(well OK, only in Langkawi. I also hear that ‘”staying drunk” is also a good way to avoid a hangover); and “Do you sometimes have the morning “shakes” and relieve them with a drink?” I dont get the shakes, tho i have drank in the morning. Last time was Saturday. So am all good. Among other ‘alco’ terms i use, there’s also alconnoisseur. Someone who knows his/her drinks. Alcopop – someone who cant hold their drinks and totally loses it when drunk, like Volume. And finally a nickname we gave a big guy who drank a lot – alcosaurus.